It was founded by Gyoki Bosatsu (668-749), but by order of Emperor Shomu. KukaiKūkai (空海) (777-835) was born in Shikoku, in the province of Sanuki (Kagawa). Kūkai was a Buddhist monk who played a significant role in the spread of Buddhism in Japan and have founded the Shingon Sect. He was a great writer, a philosopher and a poet. He is still extremely popular in Japan. Kūkai is at the origin of the Shikoku pilgrimage ( Henro michi). At his death he was given the ... came later, in 815 and requested for farmers, victims of natural disasters and the spread of the disease. He would have had a vision of Shaka Nyora preaching the of the sutras of the lotus name of this temple on a mountain sacred (Reizan or Ryōjusan) in India. It’s this history that comes the name of the temple. In the 13th century (period Muromachi period), he continues a huge expansion and owned many buildings. Unfortunately two fires in the 15th and at the end of the 19th century destroyed many halls. 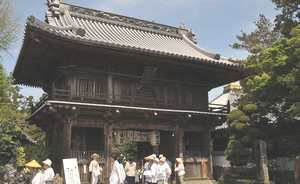 Ryōzen-ji Temple is the first of 88 temples of Shikoku pilgrimage. 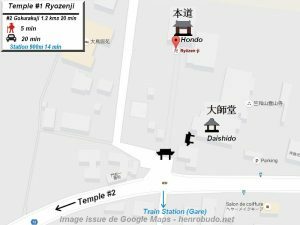 Ryōzen-ji means Vulture’s Peak Temple .In his guide Shikoku henroHenro (遍 路) is the pilgrim journey along the path of the 88 temples in Shikoku 1687 Yūben Shinnen Michishirube identifies Ryōzen-ji Temple N ° 1 of the 88 temples of Shikoku pilgrimage. Since all published guides have done the same. 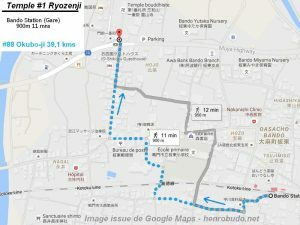 It is customary to return to Ryozen-ji after completing the pilgrimage in order to completely finish the loop. This practice is called orei mairi, a visit of thanks after finishing the pilgrimage. This practice seems relatively new. 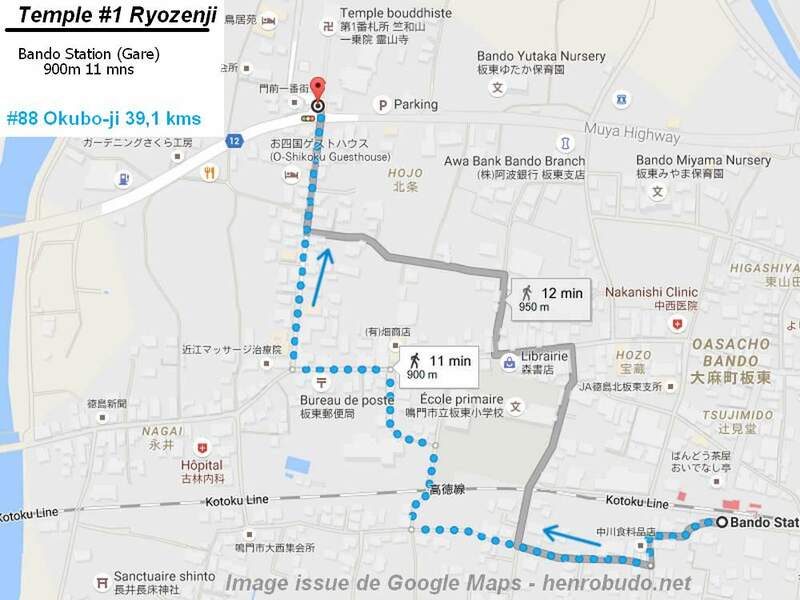 It is here that starts the Shikoku pilgrimage, so it’s a temple very visited with two shops to buy the whole panoply of the perfect henro. 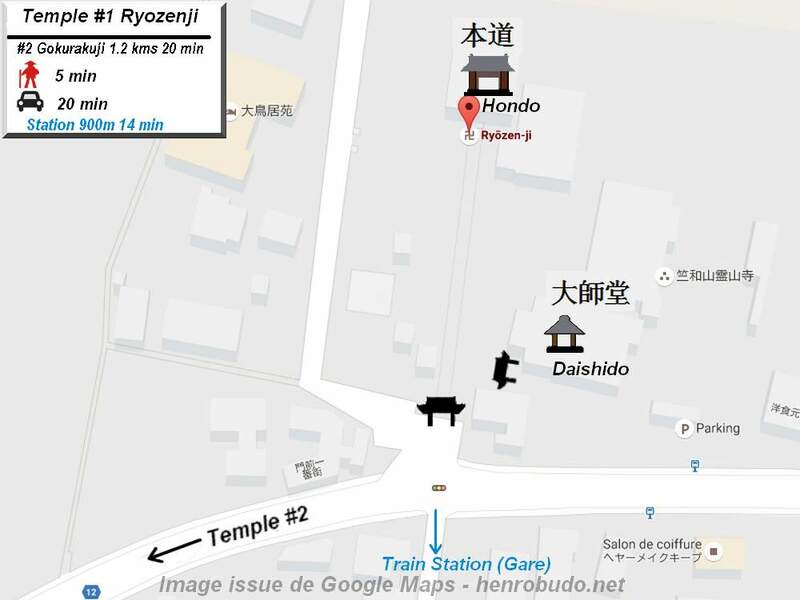 One near the parking lot, the other in the main building (HondoThe term hondō (本堂), literally means "main hall".It enshrines the most important objects of veneration. This word became commun durind the Heian period abd the developpement of Bhuddhism Shaingon and Tendai.). However, the place is quite nice with such beautiful paper lanterns of the main temple (Hondo) and a beautiful garden with roses of 200 different varieties. 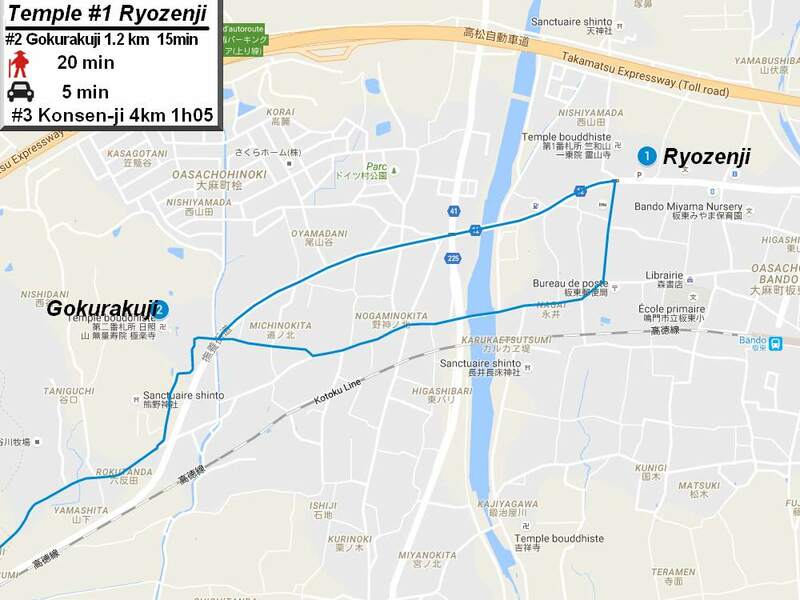 40 minutes by bus from the bus station in the city center of Tokushima. Bus 38 for Ooasa-jinja. 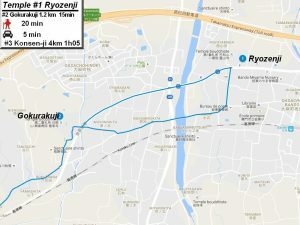 The bus stop is just in front of the temple Ryōzenji Mae.